We want you to learn Spanish to be able to use it in real life situations from day one. Therefore in our courses the four language skills speaking, listening, writing and reading are integrated in the same way you encounter them in real life. Our students may have different needs and want to learn for different reasons, so we are able to adapt to each student’s requirements and help them progress quickly and efficiently. This is why we believe in small groups which allows for personal attention. Students vary in age and background and come from all corners of the world. The average age is between 20 and 35 years. From the first day classes are taught in Spanish, the so called immersion method, which will enhance your learning experience and will force you to actively use Spanish in real situations. Teachers have years of experience and are trained for teaching this immersion method, using images, gestures and other techniques in order to to use Spanish as the sole language of instruction, also to absolute beginners in Spanish. Teachers are all native speakers with a University degree and many years of experience in teaching Spanish to foreigners. Our Spanish courses are available for all levels. If you have some previous knowledge of Spanish, you will take a placement test before the start of the course. The intensive 20 is the most popular course. If you choose this course you will have 4 lessons per day, Monday to Friday. Classes are focused on all four language skills and are a balanced mix of grammar, vocabulary and conversation. Choosing this course you will have 6 lessons per day, Monday to Friday. Additional to the intensive 20 course you have 2 extra lessons per day in a small group. During this course you will have 2 lessons per day, Monday to Friday. You will have half the classes of the intensive 20 course. Therefore to follow this course it is necessary that you are also speaking Spanish outside your lessons, usually at a job or university, so you can keep up with the pace of the course. If you are a beginner, we recommend to choose the intensive 20 course. The school is closed on official holidays. Missed (group) lessons will not be made up for. When there are less than 2 students in class, the number of lessons will be reduced proportionally. Choosing this combination course, you add one daily private lesson to your intensive 20 Spanish course. During the private lessons you have a teacher that helps you with any doubts you might have, studying at your own pace. If you are looking for a Spanish course for special purposes such as business Spanish or Spanish in a medical environment, then this course is perfect you. The private lessons are usually scheduled right before or right after the standard intensive 20 Spanish course. The same structure as the intensive 20+5 course, only adding two daily private lessons to your intensive 20 Spanish course. If you have little time available and you want to maximize and fully customize your Spanish learning process, this is the right course for you. During the individual lessons, we would normally focus on general Spanish, but if you need to learn Spanish for a certain profession, we can focus on any subject, such as Spanish for business or Spanish in a medical environment. We can be very flexible with the course timetable. The “one-to-two” or “semi-private” Spanish course works the same as the private lessons. Only they can only be booked by two students who have the same level of Spanish. The school is closed on official holidays. Flamenco embodies a complex musical and cultural tradition. Although it is considered to be part of the general Spanish culture, flamenco actually originates from Andalusia. There is no better way to experience Flamenco than to actively participate in a Flamenco course Granada, in the heart of Andalusia. We offer the Flamenco experience in 2 disciplines; “Flamenco guitar” and “Flamenco dance”. The Flamenco program can be combined with any course. Because classes are private, we can adapt the times to your Spanish course. You can start any Monday, all year round (except for holidays). In the DELE examination course we will prepare you for the official DELE exam by the Instituto Cervantes. The DELE exam itself can be taken in Spain or in your home country. If you pass the exam, you will get the DELE certificate. This is the only internationally recognized certificate of the Spanish language. During the course you will have 20 lessons of general Spanish in a group (intensive 20 course) plus 1 private lesson per day focused on the preparation of the DELE exam. Our standard Spanish courses are perfectly suited for students in their 50’s, 60’s, or older. We have students of all ages, all year round. However, for students 50 years old and above who prefer to study exclusively with their own age group we offer the 50+ course. During this course you will have 4 lessons per day, Monday to Friday. 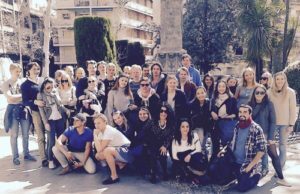 The other part of the day you will take part in activities such as a guided tour through the old city (Albaycín), tapas evening, workshop on reading Spanish newspapers, going to a Flamenco show, etc. This 2 week program includes 8 weekday activities and 1 weekend excursion on Saturday. Please note that due to the limited availability, entrance tickets to the Alhambra should be bought individually and are therefore not included in the program. If you represent a school or any organization or company that wants to come to study Spanish with a group of at least 10 students in Granada, ask us for a special quote. I stayed in Granada for 4 weeks in the summer and loved the school and the city. The teachers were brilliant and very experienced. My main goal was to improve my fluency, because I knew loads of grammar, but couldn't put it to use while speaking. I think I improved a lot. The teachers were good listeners and did a great job motivating me to speak in Spanish only. They also had a very systemised way of teaching grammar, which suited me well. And most importantly, they were the loveliest people, made the classes fun, and I consider them my friends now :) I also enjoyed the small class sizes and that the learning pace was intensive, allowing quick improvement. I chose the shared apartment for my accommodation and was satisfied with the quality, would recommend it to others. It looked nice and was very comfortable. However I thought that the kitchen wasn't as well-equipped as described, since there was no oven. Overall I would highly recommend this school to anyone motivated to learn Spanish! © SHM is a trademark of Linguaschools Granada, S.L.